Summer vagrant; bred 5 times in 4 locations. Regular migrant. Winter vagrant. The Northern Mockingbird was very rare during the Minnesota Breeding Bird Atlas (MNBBA). The Northern Mockingbird’s range spans the continent from New England to Texas, then westward, through New Mexico and Arizona to California. It also breeds in much of Mexico, the Bahamas, the Cayman Islands, and the Greater Antilles. Highest densities in the United States are found in southern and central Texas, southern Louisiana, southern Mississippi to central Georgia, and eastern New Mexico (Figure 1). A permanent resident in its core range in the Southeast from Pennsylvania to Missouri and then westward through the southern Great Plains states to California. A partial migrant in the northern portions of its range. Mainly an insectivore in the summer; switches to berries and fruits in the fall and winter. An open-cup nest of dead twigs that is lined with grasses, leaves, and often trash; placed in dense vegetation usually 1 to 3 m above ground, but sometimes higher and occasionally on buildings. Breeding distribution and relative abundance of the Northern Mockingbird in North America based on the federal Breeding Bird Survey, 2011-2015 (Sauer et al. 2017). The Northern Mockingbird has been part of Minnesota’s avifauna since the 19th century. Roberts (1932) cited records in 1883 (Otter Tail County), 1896 (Hennepin County), 1898 (Carver County), 1917 (Goodhue County), 1923 (McLeod County), and 1928 (Hennepin County), but he concluded that no “nests have been found in Minnesota thus far.” In the 1936 edition of The Birds of Minnesota, he quoted an account by Sigurd F. Olson for the winter of 1932–1933 in Ely, St. Louis County, where a mockingbird “appeared on December 26 1932 feeding on the berries of the Virginia creeper” on a neighbor’s porch and remained there feeding as well on mountain ash trees nearby until “it froze to death, February 11th . . . following a night of about 40” degrees below zero. This episode illustrated why it is difficult for this species to become an established breeding resident in Minnesota. The first nesting observation for the state was in 1968, when a pair successfully nested in a yard in Royalton, Morrison County, and returned in 1969 and nested again successfully (Nagle 1969; Huber 1968; Russell 1969). Mockingbirds have bred successfully 3 times since 1969, including the following: in 1977, Rock County (Eckert 1977); in 1996, Hennepin County (Wiens 1997), and in 2002, Dakota County (Mattsson 2003). Despite these 4 county nesting records, there is no evidence that a permanent population has been established in Minnesota. The Northern Mockingbird occurs in the state yearly. Records from 1961 through 2014 are in the Minnesota Ornithologists’ Union’s published seasonal report database. In the 50-year time span from 1961 to 2011, vagrant birds have turned up in almost all counties in the state (83 out of 87). Most records are during the migratory seasons; it is much more abundant in the spring than in the fall. During the summer season, migrants commonly linger well into June, and wandering vagrants can be found in late June and July. In the winter season, there are records in about half the years, but overwintering is very rare. By 1987, there were “two records of birds surviving until late February in Duluth, and there are four records of birds surviving until spring in the Twin Cities area” (Janssen 1987). Recent records include a 1997 overwinter observation in Detroit Lakes, Becker County, and a 2002 record in Duluth. Except for the Morrison County record described above, there are no observations that birds found in summer, with or without breeding evidence, return to the same place in subsequent years. In recent years, there is good evidence from the observations in the Minnesota Ornithologists’ Union’s seasonal reports that Northern Mockingbirds have become more abundant in spring migration. The number of spring migrants seen increased in the 1990s and became noticeably larger in the 2000s. From 2003 to 2007, the spring seasonal report called the migration “heavy, a major influx, an invasion,” and yearly numbers varied from 20 to 57 birds, peaking in 2005. There are more records in the heavily birded areas, like the Twin Cities and the North Shore of Lake Superior, but the gradual increase in spring numbers from the North Shore from Duluth to Cook County is striking. During the 1960s and 1970s, single birds were found 25% of the years; from 1983 to 1992, 2 birds were found 90% of the years; from 1993 to 2004, 3 birds were found in 100% of the years; and from 2005 to 2014, 4 birds were found in 90% of the years. Weather and climate change are likely associated with these trends. Increased numbers could lead to successful breeding and locational fidelity or to permanent residency for this species in Minnesota. The participants in the MNBBA reported 8 records, all of which were coded as “possible” breeding evidence during the atlas years from 2009 to 2013. The records were widespread throughout the state and included 2 each in Cass and Polk Counties, and 1 each in Cook, Grant, Lac qui Parle, and McLeod Counties (Figure 2). These records follow the pattern of incidental observations of birds lingering into late June. One record of a bird in July 12–13, 2013, in Grand Marais, Cook County, was probably a vagrant, as has commonly been observed on the North Shore. A query of the MOU seasonal report database during the atlas years and the atlas safe dates (6/1–8/1) turned up 15 additional summer records: 13 observations of lingering spring migrants (North Shore counties, 7; Twin Cities counties, 3; singles in Waseca, Murray, and Goodhue Counties) and 2 July vagrants (Washington County 7/16/2009, Blue Earth County 7/18/2009). Breeding distribution of the Northern Mockingbird in Minnesota based on the Breeding Bird Atlas (2009 – 2013). Summary statistics for the Northern Mockingbird observations by breeding status category for all blocks and priority blocks (each 5 km x 5 km) surveyed during the Minnesota Breeding Bird Atlas (2009-2013). The Northern Mockingbird’s habitat varies across the continent, but the species basically prefers open areas with sparse vegetation. In the East, it frequents human-dominated landscapes, like towns, farms, suburbs and other areas with parks, gardens, lawns, and thickets. In the West, it is found in desert scrub, chaparral, and residential and other developed areas. Partners in Flight estimates a United States and Canadian population of 33 million birds (Rosenberg et al. 2016). 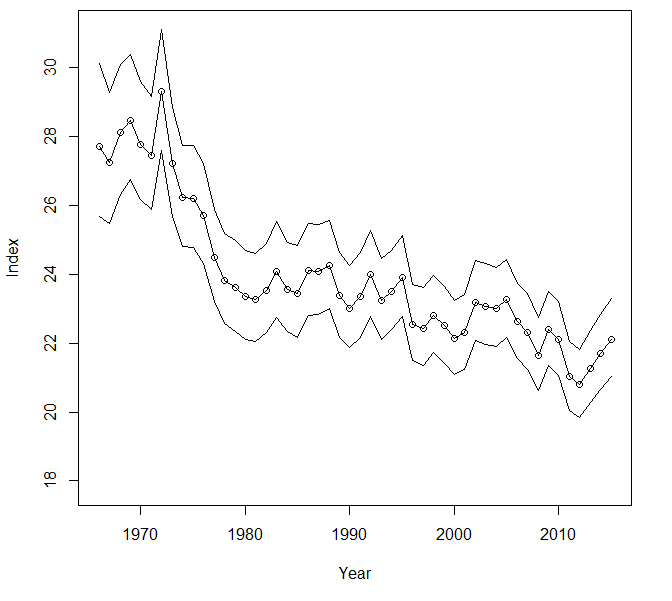 The federal Breeding Bird Survey suggests a significant declining population in the United States of 0.46% per year from 1966 to 2015 (Figure 3). There are significantly declining yearly trends for 15 eastern areas; the largest declines are in Peninsula Florida (2.62% per year) and New Jersey (2.60% per year). There also are significant increasing trends in California (1.08 % per year) and Utah (2.80% per year) in the West, and in New York, Ohio, and North Carolina in the East that vary from 0.43% per year to 2.25% per year. Also notable is an increase of 2.66% per year for the Lower Great Lakes–St. Lawrence Plateau. Overall, Rosenberg estimated a decline of 19% in the United States and Canada from 1970 to 2014. Breeding population trend for the Northern Mockingbird in the United States for 1966–2015 based on the federal Breeding Bird Survey (Sauer et al 2017). Partners in Flight assigned the Northern Mockingbird a relatively low Continental Concern Score of 8/20, which reflects little conservation concern for the species in North America (Rosenberg et al. 2016). The wide distribution and large overall population in North America currently provide stability for the species’ future, but continued monitoring of its population is suggested due to its recent decline. Interestingly, the Migratory Bird Treaty Act of 1918 gave protection to this species, which was sorely needed because the Northern Mockingbird had been exploited in the caged-bird trade since the late 1700s. The species was kept as a pet because of its singing ability, and by the end of the 19th century, its numbers in many northeastern areas were severely depleted. After this species and others were given protection in the early 20th century, it took many decades for areas of local extinction to be repopulated by birds from the southern states (Farnsworth et al. 2011). Eckert, Kim R. 1977. “Second Minnesota Nesting of the Mockingbird.” Loon 49: 229–230. Huber, Ronald L. 1968. “The Summer Season.” Loon 40: 118–130. Mattsson, James P. 2003. “Northern Mockingbirds Nest in Dakota County.” Loon 75: 116. Nagle, Leo. 1969. “Mockingbirds Nesting at Royalton, Minnesota in 1968.” Loon 41: 128. Russell, Robert P., Jr. 1969. “The Summer Season.” Loon 41: 105–119. Wiens, Terry P. 1997. “The Summer Season (1 June to 31 July 1996).” Loon 69: 11–28.